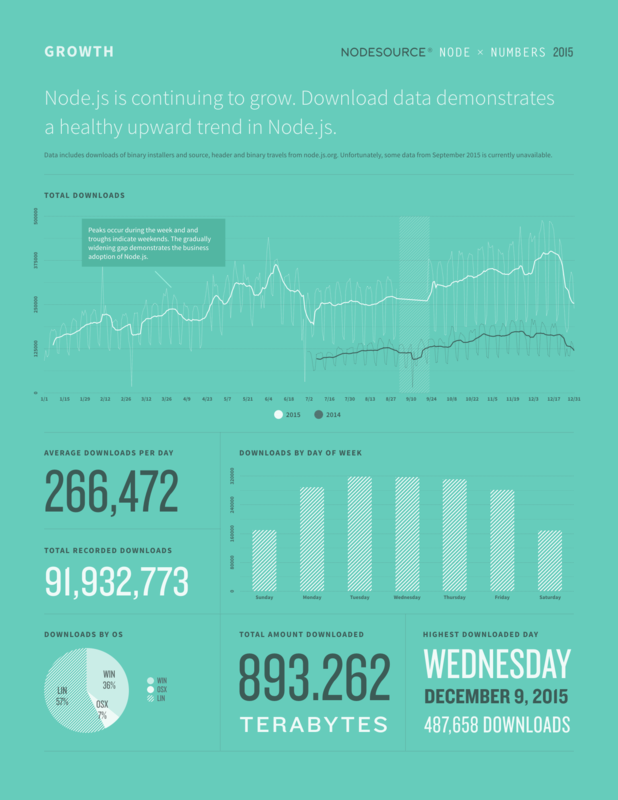 2015 was arguably the year that Node.js grew up. It was the year that we formed the Node.js Foundation, backed by some of the biggest names in the software world. At NodeSource, we hear a constant stream of news from companies adopting Node.js as an integral part of their software stack. But, as big believers in the transformative power of the platform, we're not surprised when the value of Node.js becomes apparent to new companies. 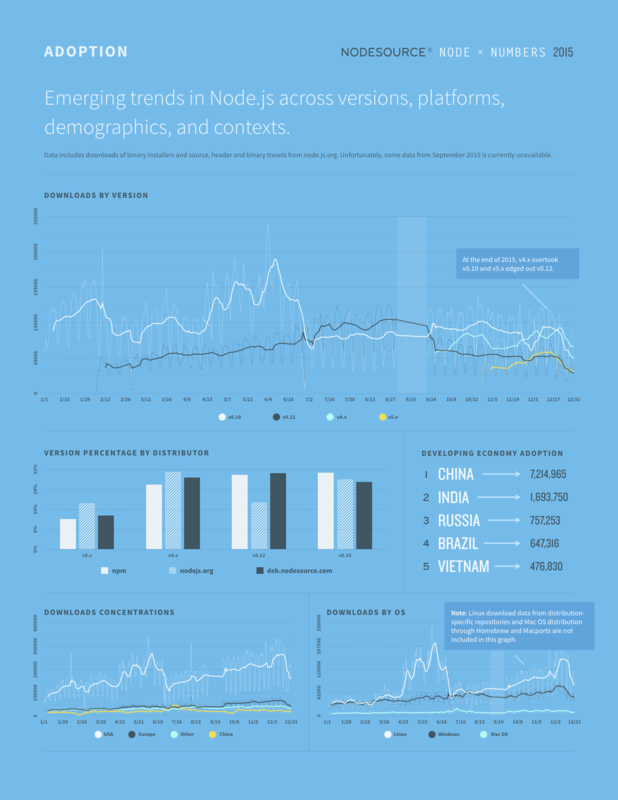 Node.js adoption and usage trends can be inferred from many sources. One of the richest sources of data is nodejs.org itself. By analyzing the logs for binary and source downloads, we get to discover some interesting patterns. Every way we slice this data we find trends that point to an increasingly healthy and popular ecosystem, with new users, both casual and corporate, being added every day. Looking inward, we can also analyze the health of the Node.js project itself. Git provides the richest source of data and we can track changes all the way back to the 16th of February, 2009 when Ryan Dahl first started constructing what would become the world's most popular software ecosystem. Tracking the metrics we can glean from Git and GitHub is becoming increasingly important as we measure the impact of the new open source governance model being pioneered by the project. 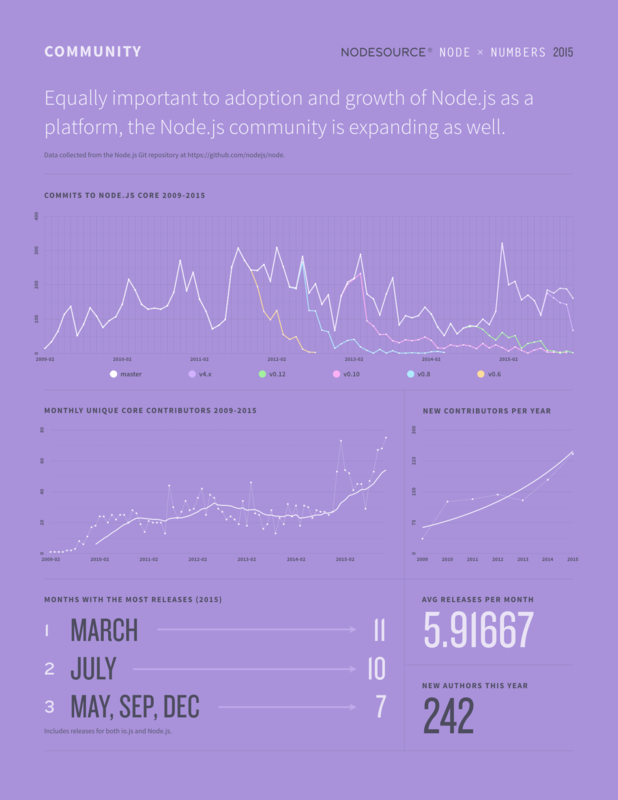 Number of commits, unique committers every month and total committers over time all suggest that 2015 has been an impressive year for contributions, but there's more work to be done as we attempt to ensure that Node.js is guided and developed by a broad and diverse cross-section of its user-base.